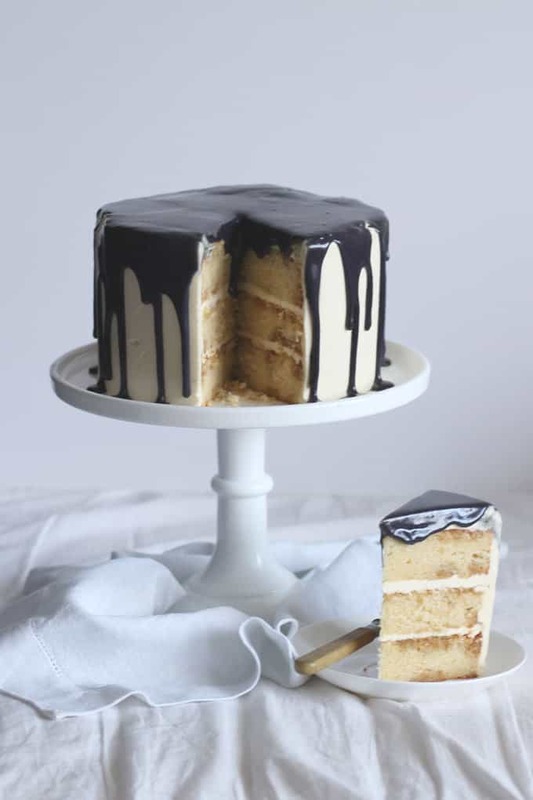 London Fog Cake – A light, layer cake infused with Earl Grey Tea syrup and sandwiched with whipped vanilla buttercream frosting, with a white chocolate ganache. 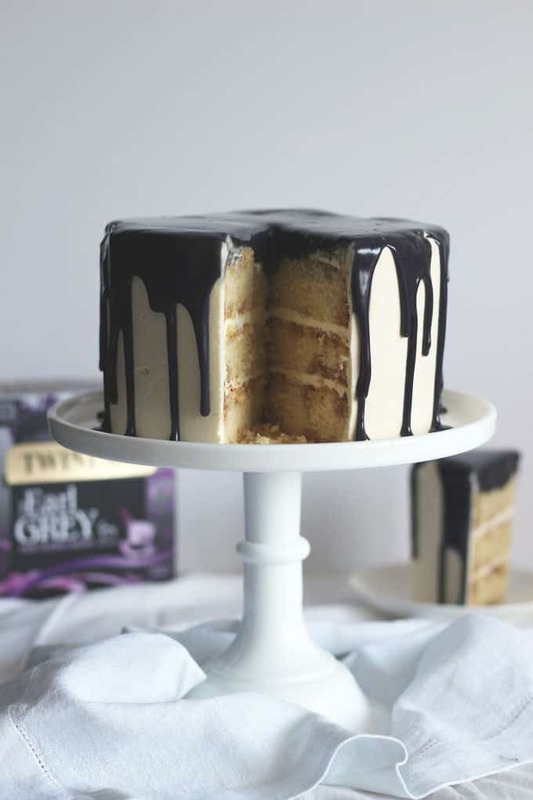 Earl Grey Tea Latte in a easy to make and bake drip cake. I know, I’ve posted a lot of cakes lately. Sorry (well, a bit at least). It’s that time of year though isn’t it? They days outside are grey and all I want to do is curl up under a blanket with a cup of tea and a piece of something sweet. There is something so terribly British about being inside, whilst the rain comes down in sheets against the window and a steaming pot (or mug) of tea brews in front of you. For me, that tea is always Earl Grey. I went for years dilly dallying between builder’s tea (English Breakfast if you’re not a Brit), Rooiboos (caffine free during pregnancy started that) and fruit blends. Then suddenly, a sniff of Earl Grey and I was hooked a few years ago. Whilst I can’t get enough of this aromatic tea, my husband cannot even bear the whiff of it. But every morning, he dutifully brings me a mug in bed. That’s love. Now, if I could only get him to deliver a slice of this London Fog Cake with it..
Did you see my Apple Chai Spiced Bundt Cake last week? Twinning’s sent me two of their new tea blends to try, the first was their Spicy Chai infusion and the final one was their Earl Grey blend. As I sat here at my desk watching the weather roll past the window, a steaming cup of the Twining’s Earl Grey inspired this cake. I’d been reading about how much care and attention goes into picking these blends and as with my Apple Chai Spiced Bundt Cake, I decided to channel some of that into a recipe. London Fog is actually a Canadian name for a drink made using Earl Grey tea, steamed milk and vanilla syrup. Also known as Vanilla Tea Misto or an Earl Grey Tea Latte, no one is quite sure of where it originates but I’d seen lots of mentions of the drink on Pinterest (obviously) and so I thought I’d come up with my own interpretation. 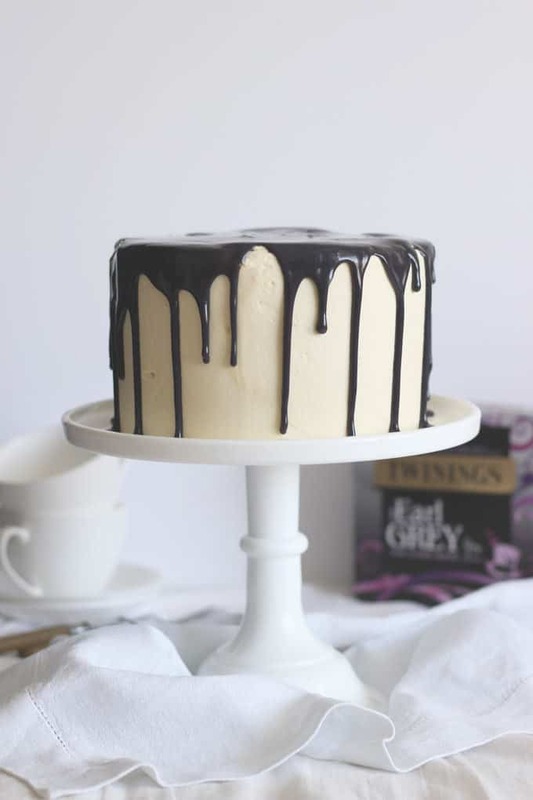 This tea has such a unique flavour, it would be almost impossible to make a London Fog cake without using a tea infusion and this Twining’s blend really is a special one. The Twining’s tea buyers scout the globe for the best leaves and then blend and create this infusion using the collective 250 years experience between them. That’s some serious tea passion right there. Perhaps it was the weather, or the tea, but it felt right to give this tea a touch of grey. 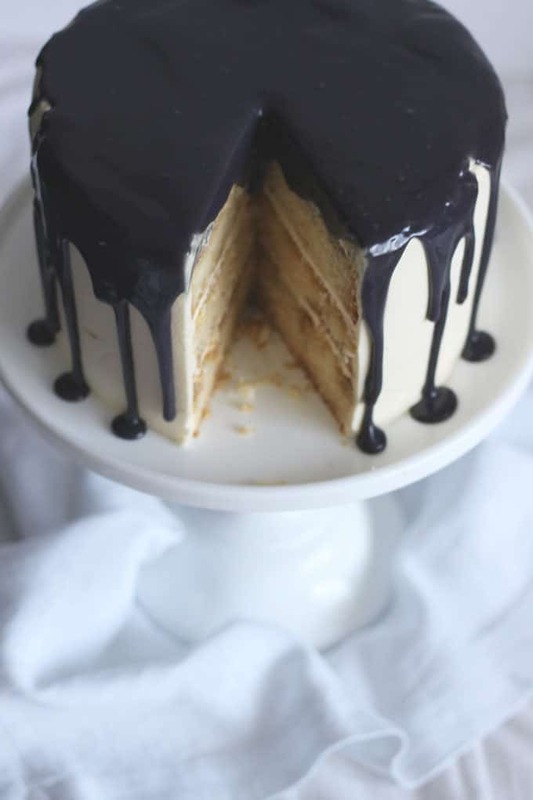 Hence the ganache drizzle (oh I do love a drip cake right now). I hope this cake and the cup of tea can brighten up a grey day of yours. For more tea baking inspiration, please visit the Twining’s Bake Off. Of course, it goes without saying that I really suggest using excellent quality Earl Grey tea to make the syrup. You can buy the Twining’s Earl Grey Tea in major supermarkets in the UK or online via Amazon here: Twining’s Earl Grey Tea. Make sure you do trim the cakes as they will be impossible to stack evenly otherwise and you’ll have a leaning tower of cake. Check the ganache consistency by drizzling at the back of the cake first! Make sure you use gel/paste food colouring suitable for use with chocolate. These are the only ones I recommend and use (available from Amazon): Black Extra Gel Food Colour. 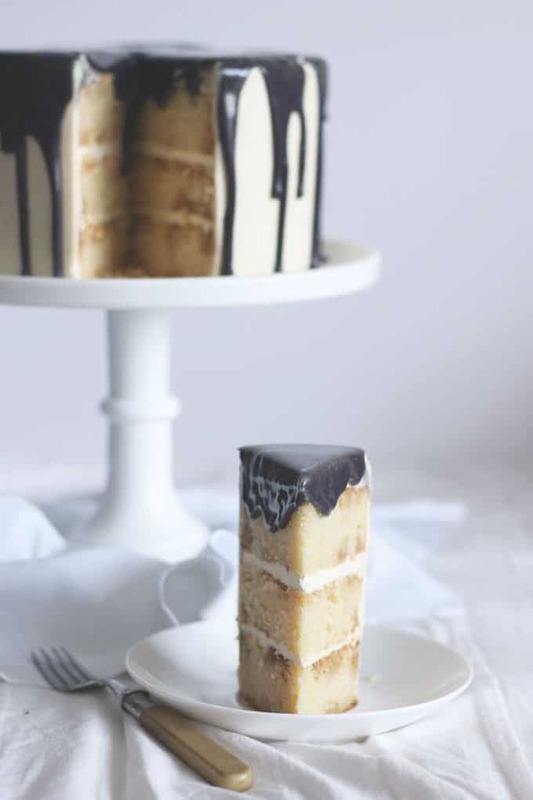 As always with layer cakes, good tins are a brilliant investment, they really help to cook them evenly. These are the tins I use and would recommend (available from Amazon): 7″ Deep Tins. To get a smooth finish on your cakes, there are two tools that are SO useful and really good value for money, they are both available from Amazon, the Angled Palette Knife and the Plastic Cake Scraper. Honestly, that scraper is THE best £1.00 cake purchase ever! I’ve started to always use this white chocolate for making the perfect drippy ganache, it has made such a difference. It’s an investment to buy in bulk (about £14) but lasts for ages and actually works out about the same price as the supermarket chocolate: Callebaut White Chocolate Chips. One last thing, please use good quality vanilla extract never essence, it makes such a difference in any recipe using vanilla. This is the one I always use: Nielsen-Massey Pure Vanilla Extract. Grease 3 x 7" cake tins and line the bottom with baking paper. Mix together the butter and sugar and beat until very pale and fluffy. Add the eggs, one at a time, beating until very well mixed in and light and fluffy before adding the next. Gently stir in the flour until combined. Mix in the vanilla extract. Spoon equally between the 3 tins and smooth out the top. Bake for 30 - 35 minutes or until a skewer comes out clean. Allow to cool and then carefully turn out from the tins. Whilst they are baking or cooling, make the syrup and the icing. For the syrup, pour 250ml boiling water over the 6 teabags and allow to infuse for 10 - 15 minutes. Remove the tea bags, pour the infusion into a small saucepan and add the caster sugar. Warm gently until all of the sugar is dissolved. Remove from the heat and allow to cool. Next, make the icing. Beat the butter until light, fluffy and pale. Add the icing sugar and beat until fluffy. Add the vanilla and mix until combined. Remove the cakes from the over and whilst still in their tins, drizzle the tops with half of the syrup. After 20 - 30 minutes remove from the tins, turn the cakes over, remove the baking paper and pour the remaining half of the syrup over the bottom of the cakes. Allow to sink in for about half an hour. When the cakes are totally cold, trim down the tops so they are flat and even. Sandwich together with the vanilla frosting, so you have a stack of 3 cakes. Coat the outside with the icing and smooth well, put the cake in the fridge. Make the ganache by heating the cream until just bubbling. Remove from the heat and stir in the chocolate until fully melted and the ganache is thick. Add food colour, a little at a time until the ganache is the colour you'd like. Allow to cool and thicken until it is spoonable consistency (you may need to put it in the fridge for this). 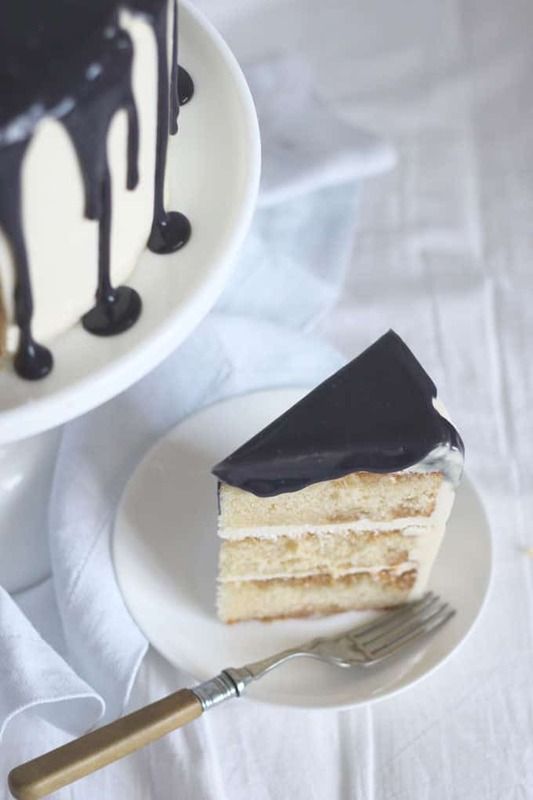 Remove the cake from the fridge and drizzle the ganache. Disclosure: This recipe was an advertorial post commissioned by Twinings. As always, all opinions are truthful. This post contains affiliate links. What a beauty! You’re the best at making ‘big bad cakes’ (‘bad’ meaning good, if that makes sense). It looks stunning and it would be so nice right now with a cuppa! This cake looks delicious, it’s hard to top a hot cup of earl grey tea on an autumn day. 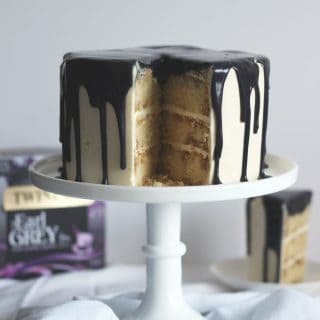 I’d never heard of a London fog cake till recently and this one looks amazing! I’ve never heard of using tea to make cake but this one looks delicious even if I am more of a coffee girl! Thanks Tracey, I am too normally, but love Earl Grey! Just wondering why is this called Fog cake? Fantastic! 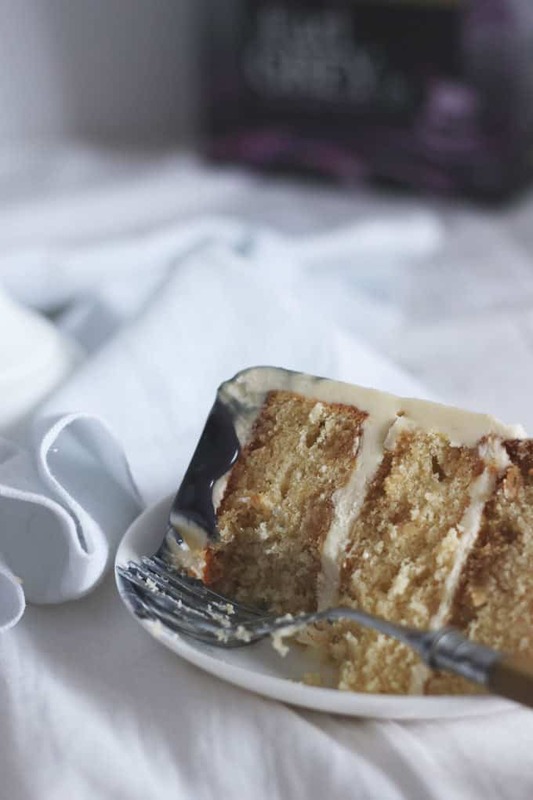 The best earl grey cake recipe i’ll ever have now. I just simple love your recipe.